I found this idea at KinderArt, which is a wonderful resource for craft ideas and activities for kids. 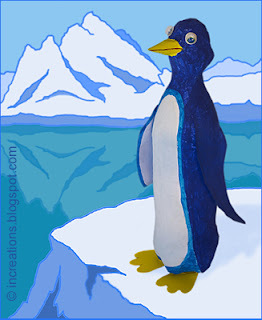 Our penguin is slightly different from the KinderArt's one. We used a plastic bottle and covered it with small pieces of paper and glue (about this technique). You may pour some sand into the bottle for stability. Then we crumpled a paper ball for penguin's head and glued it onto the bottle neck, covered the whole thing with another layer of paper mache. For the beak and tail we rolled up two small paper cones. Then cut out and attached feet and wings. After letting the penguin dry, painted him and glued eyes.